One little trick-or-treater finds a haunted house more haunted than he could have imagined. Another brings her new friend a grisly treat. Candy-hunting children meet all sorts of macabre ends in the watercolor comic series "The Last of the Trick-Or-Treaters." Randy Milholland, creator of the long-running webcomic Something Positive, occasionally posts one-off comics to his site Rhymes With Witch. 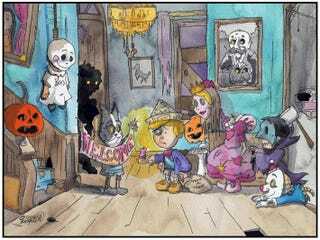 Recently, Milholland has been working on "The Last of the Trick-Or-Treaters," a series of gruesome Halloween-themed watercolors. He adds a bit of chilling text to each painting and has been posting them to RWW. The effect is a bit like Edward Gorey's wryly pedocidal poem "The Gashlycrumb Tinies," with an added dash of Halloween horror. Were I an eight-year-old in a plastic mask, these comics would leave me sleepless until November First. Also worth checking out is Milholland's current Something Positive storyline, which centers around a roleplaying game set at a fantastical high school.